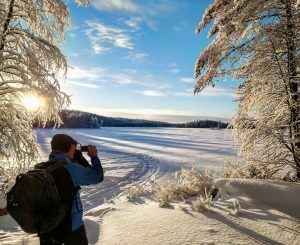 Finland is usually known abroad from sauna, Nokia, snow, northern lights, Angry Birds, polar nights and Kimi Räikkönen, all of which are an integral part of our country. Being aware of our war history with the Soviet Union might also occur but there sure is some much more interesting and intriguing things concerning us Finns and Finland than those based on the built brand and new entertainment culture. One interesting fact is that the ancient hunter-gatherers and the people already engaged in agriculture lived here side by side for over one thousand years before they blended with each other. This has been proven based on archaeological findings. It is believed that these farmers arrived here from the southern Europe because these two groups had significantly dissenting genetics. When the genetics were compared, the scientists found out that the modern Finns are genetically closer to the Stone Age hunter-gatherers than any other European people. So it is justified to say that here the roots really are closer. In the oldest written source that is known to describe the ancestors of modern Finns, the 2000 years old “Germania” written by Roman historian Publius Cornelius Tacitus, our ancestors are described as savages who have no sophisticated weapons, no horses and no permanent place of residence. Plants and game meat is their only food, animal fur is their only clothing and earth´s surface is their only place to lay their head on. But despite their primitivism, these people are seen as incorrupt and innocent compared to the decadence of the Roman Empire. A strong connection with nature, emotional well-being and extraordinary wilderness skills are also highlighted. Especially here in Hossa area it is fascinating to wonder and imagine the exceptional relationship that those people have had with their environment and their life in general because here we have many preserved traces and proofs of them. The circumstances are many times so harsh that surviving here with primitive tools and clothes has been a constants struggle and a miracle itself. The most distinctive of these signs of the Stone Age humans is the 3500-4000 years old Colored Rock that is Finland´s northernmost and the most extensive rock painting. There´s over 60 separate patterns and figures that have been found in it and the location of the rock itself is fascinating because it´s situated in a place that really stands out from its surroundings. Most probably it has been a sacrificial site where people have worshipped their gods, performed rituals and implemented their animalistic and shamanistic worldview common to all indigenous people. The Hossa area not only shows but also embodies our history and the forgotten way of living that is being wiped away from these sparsely-populated areas at accelerating speed. 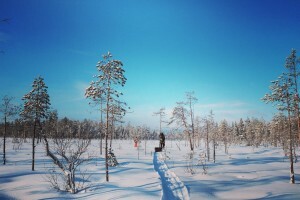 That is because here in the northern Finland close the Russian border, life has been very modest without any conveniences only a few decades ago and we have several visible signs which reflect the different periods of time in our history of developing towards being a modern society. Besides, here we still live at the mercy of nature in its way and the cycle of the seasons defines the frames of living. Old tar pits tell a story of Finland being the world´s number one exporter of tar during the colonial period when wooden ships were still used, memorials around the municipality and the winter war museum remind us of our battles with the Soviet Union and logging sites and cabins provide us with images of the effective postwar reconstruction and the explosive industrial growth. It was not until the 1960s when modern comforts including electricity reached these areas and asphalt roads were built. Stimulated by new ideals, people started to move into towns looking for jobs and better standard of living. After joining the European Union in 1995, small scale farming became almost impossible and this accelerated the forced abandonment of the countryside even more. Anyways, this long-standing isolated living at the mercy of nature has highly affected the everyday life and thereby the local culture. Nature has been the source of livelihood in many ways and the arctic weather has set its own limits to food production. That´s why knowing your environment, learning the behavior of animals and mastering different wilderness skills has been vital. Normal cattle herding and extensive agriculture hasn´t been possible because there isn´t too many animals that survive in these conditions and in addition, the growing season is extremely short. That´s why reindeer-herding has been an important source of livelihood for hundreds of years and it still is. Life has always been hard here and people have had to fight for their living, this has shaped the whole mentality of the people. Compared to south and central European people Finns are more reserved and not showing their emotions that much. But don’t get me wrong, in general we Finns are very polite, hospitable and helpful people. 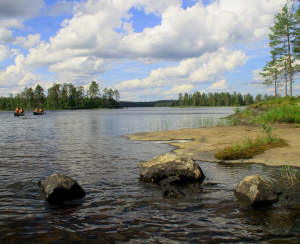 As a conclusion, the Hossa area truly provides an authentic setting where You can simultaneously explore the essence of Finnish culture that is highly based on nature, get to know our history and give your mind a dip in the wild by participating in seasonal nature activities of your choice!